One-day festival on Feb. 7 features clinics, daytime performances, and an evening concert; all performances and clinics are open to the public. MSU BILLINGS NEWS SERVICES — Montana State University Billings jazz students will share the stage with headliners Matt Otto and Darrell Green during the university’s Jazz Festival on Feb. 7. 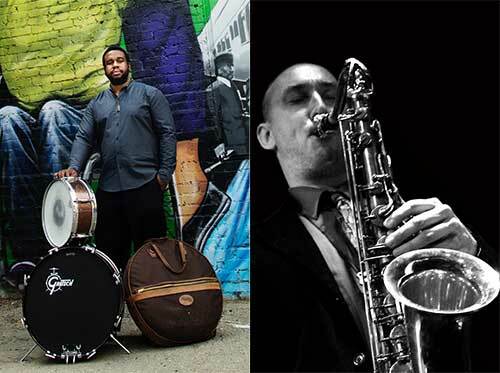 The 20-student ensemble will perform with Kansas City jazz saxophonist Matt Otto and Darrell Green—a premier drummer of the New York City and international scene—as part of the festival’s finale concert at 7 p.m. in Petro Theatre on the university campus. Having lived in Japan for five years, New York City for seven years, and Los Angeles for six years, Otto has performed with a variety of artists including Anthony Wilson, Larry Koonse, Rashid Bakr, Ben Monder, Wadada Leo Smith, Willie Jones III, Alan Ferber, Mark Ferber, Albert “Tootie” Heath, Gregory Hutchinson, Jonathan Kreisberg, Charlie Haden, Joe La Barbera, Leroy Vinegar, Jimmy Smith, Paul Jackson, Ari Honig, Ben Street, Mike Moreno, Sara Gazarek, Josh Nelson, Danny Weiss, William Parker, Matt Wilson, Steve Cardenas, Bobby Watson, Bob Weir, Deborah Brown, Larry Goldings, Jerry Bergonzi, Eric Harland, Sheryl Bailey, Darek Oles, Erik McPherson, John Stowell, Ralph Peterson, Alan Pasqua, Kurt Rosenwinkel, Reggie Workman and many others. Otto is the co-founder of the Los Angeles Jazz Collective. Otto now calls Kansas City home where he is currently the Assistant Professor of Jazz Studies at Kansas University (KU) teaching Jazz Theory and Performance, Jazz Combo 1 and private lessons. Otto is also an Adjunct Professor at the Rutgers New Brunswick teaching online courses in jazz improvisation, theory and performance. Over a career that has spanned more than two decades, Oakland, Cali. native Darrell Green has become a master drummer and proliﬁc sideman, sharing stages with leading jazz artists, from Blue Note vibraphonist Stefon Harris to saxophonist Red Holloway. Though jazz is his primary focus, Green is conversant in every genre, from straight-ahead jazz to Latin and West African music. Green currently works with his trio and quartet, performing all over the world. He currently tours with Cassandra Wilson, Pharoah Sanders, Dr. Lonnie Smith, Antoine Roney, Sherman Irby, Steve Turre, Wallace Roney, Faye Carol, Russell Malone, Amina Figarova, The Black Arts Collective, Chester Thompson, Jeremy Pelt, Charles Tolliver and Charenee Wade. He is one of the most in-demand drummers in New York, Europe, and Japan. “Each year our concert features world class talent which is an exciting opportunity not only for our student musicians but for the Billings community as a whole to experience jazz culture of this level,” said John Roberts, Jazz Festival Coordinator and Assistant Professor of Low Brass. The fifth annual Jazz Festival also includes clinicians Brennan Baglio—jazz vocalist, Eric Richards—trombonist and Kelly Berdahl – Bozeman High band director, who will be adjudicating the 20 college, High School and Middle School bands throughout the day. Along with performing, these artists also act as clinicians during the day-long event. These clinics are held for regional middle school, high school, and collegiate visiting bands to improve skill levels and musicianship. Clinics will begin at 9 a.m., held in Cisel Hall and Petro Theatre. Spots are still available for interested jazz choir and jazz band groups to participate. All groups are welcome at any level, including Combos, Big Bands, Rock/Blues ensembles, Concert bands playing Jazz selections, Vocal Jazz, acapella groups of any size, or even Chamber Ensembles such as brass groups or guitar ensembles. “The day is about education and performance, as students learn from world class musicians and gain valuable performance experience alongside these musicians,” Roberts said. All performances and clinics are open to the public. Tickets to the evening concert are $10 for general admission. MSU Billings faculty and students are admitted free with ID. Tickets will be sold at the door. Learn more about special guests Matt Otto, Darrell Green, Brennan Baglio, and Eric Richards. To register a group or for more information about the Jazz Festival, visit http://www.msubillings.edu/jazz/.